Few things in this world entice and frustrate me more than puzzle games, and Nairi: Tower of Shirin is no exception. This Kickstarter success story caught my eye with its quirky cast of characters, hand-drawn art, and the promise of a story which draws inspiration from a number of sources, ranging from anime to Disney Pixar. I was excited to dive into the game, but also fell a small bit of dread which always accompanies reviewing any puzzle game; the game is not yet out, so there’s no Googling for help if you get stuck. Nairi: Tower of Shirin tells the story of a young girl in classist desert city. The daughter of a councilmember, Nairi was born into the Rich District and, through her father’s strict rule, was allowed to experience very little of the outside world. But this isn’t a story about a poor, pampered rich girl, it’s the tale of a scrappy survivor overcoming the odds to save her family, her friends, and her city. Nairi may be in over her head, but that’s not going to slow her down. The story admittedly starts a little slow, but there is also a whole lot of story to set up. Through a series of unfortunate events, Nairi finds herself stranded in the Great Desert beyond the city and has to try and smuggle herself back into the Rich District to try and reunite with her parents. Along the way, she teams up with some cat bandits, a rodent scholar, and a gang of ducks… just to name a few. Each character is unique, and the cartoony, hand-drawn feel of the character portraits make a nice contrast against the beautiful, painterly feel of the backgrounds. The gameplay is classic point-and-click adventure, though with a few changes, to allow it to work on the Switch. You can play two ways, either using the thumbsticks to move a cursor around the screen (there are no options to use gyro or motion controls), or you can simply tap the screen. While tapping the screen is quicker in handheld mode, using the thumbsticks to move the cursor around the screen gives you a bit of useful iconography, since the cursor changes to an arrow to signify exits, a magnifying glass for things to inspect, a hand icon for things you can interact with–as well as for things you can’t. You can’t tell by looking what will and won’t produce an item, a hidden coin, or drive a character to give you a hint, so it’s worth trying to interact with everything you can. It’s easy to see how you interact with the world, though it’s not always obvious. I found myself stuck walking in circles on more than one occasion due to Nairi’s pared-down tools. It’s not always obvious when you can move to another area and when you can’t; at one point I was stuck inside the bazaar where I needed to, in classic adventure game style, collect a number of items in order swap them for other items to help me progress in the story. I could not find two items no matter how much I searched, and actually restarted the entire chapter before I realized that there was another area I hadn’t yet explored. Not only was it not obvious that there was another area I could move to, the characters actually told me I should stay away from that area, so I assumed it was off limits. Once I wandered that way, the confounding puzzles which had delayed me for an hour were easily solved. The shifting viewpoints of the different scenes also make navigation confusing; I would have gladly given all of Nairi’s hard-found coins for a minimap. One of the most befuddling areas in the game is a section of the city where you move onto the next screen by tapping or clicking the left side of the screen. This new scene shows you a warehouse… and you must tap/click left again to go back to where you were, while tapping/clicking the right side of the screen takes you to an entirely new section of the city. With no mini map, no compass, and no real landmarks to help you out, you have little choice but to memorize most of the city, or walk in circles for way too long. Nairi: Tower of Shirin also has a few bugs, which will hopefully be ironed out shortly, but these bugs are compounded by the lack of ability to save at will. You’re given the option to save only after completing certain parts of the game, which means that if your battery runs out, you accidentally close the game, or if you encounter a bug, you’re forced to replay the same set of puzzles again. I kept coming across a bug where, after opening certain items, especially portraits, books, and a cypher tool, these pages would not close. You must view everything except a collection of images dedicated to the game’s Kickstarter backers in order to advance the game, both took place very late in the game, and both were far removed from a save point. This meant that I replayed the same dozen or so puzzles no less than four times–only to have the final puzzle bug out and not reset once I’d made a mistake, requiring me to play these puzzles through for a fifth time. Again, this is hopefully something that will be quickly patched, but allowing players to save after a particularly frustrating or time-consuming puzzle would have made this game so much more enjoyable. I’m delighted to say that Nairi’s puzzles are challenging and fair; I had to call in backup for two puzzles which I simply could not figure out on my own, but managed to tackle them all the same. There is a hint book, which offers clues to help you riddle your way through, and even offers the occasional, much-yearned-for map, but this also seems to be bugged, and the hints and maps often don’t appear until after you’ve moved on to the next chapter–if at all. I discovered two hints, one of which appeared in my guide book, one of which I literally took a photo of with my phone, so I could reference it as I played. Once the game goes live, I expect this to be patched up or at least spread across Google, making it less of an issue. The story itself is an intriguing tale combining an ancient civilization, mystical technology, rival gangs, brainwashing, and political greed. I found myself enthralled both with the unfolding tale and the quirky cast of characters I got to adventure alongside. I really did fall in love with Nairi’s eagerness to touch seemingly every skeleton she comes across, Rex’s love of history, the cat bandit’s tale of woe, gentle Sami’s fretting, and even Bill’s seemingly endless quest to be one of the cool ducks. Of course, it’s worth noting that this is only the first part of Nari’s tale. 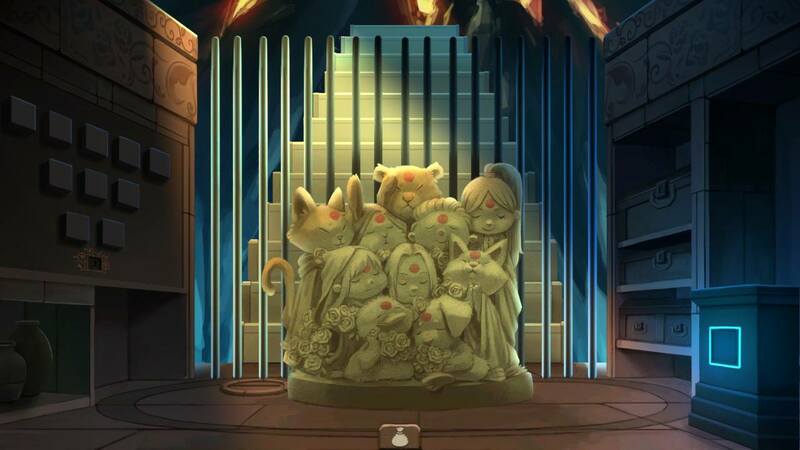 Nairi: Tower of Shirin ends on a cliffhanger, leaving the future of both Nairi and Shirin as a whole in question, and me hungry for the next round of adventures in this cute, clever, and slightly morbid world.